January 4, 2016 – In this episode, we’re racing the time machine through a bunch of stops around the world and throughout history. 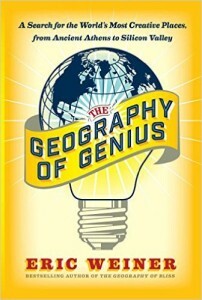 Our ticket is The Geography of Genius: A Search for the World’s Most Creative Places from Ancient Athens to Silicon Valley . We’ll be guided along the way by Eric Weiner, author of the New York Times bestseller The Geography of Bliss , as well as the critically acclaimed Man Seeks God . You can sleuth out more about him @Eric_Weiner on Twitter, or at EricWeinerBooks.com.